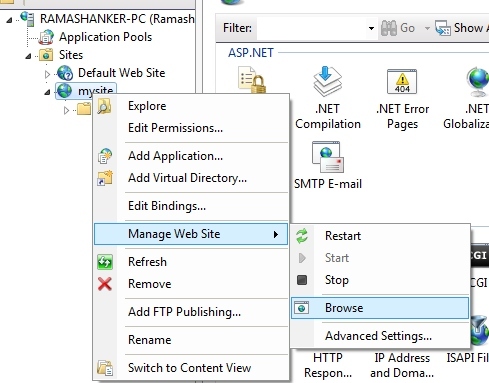 Today i am going to host a ASP.NET website on IIS Server in Window 7.Here i have used visual studio 2010.if you are using visual studio 2010 then first install .NET Framework 4.0 or 4.5 on your system.For download .NET Framework 4.5 Click here .Because Window 7 support .NET Framework 3.5. 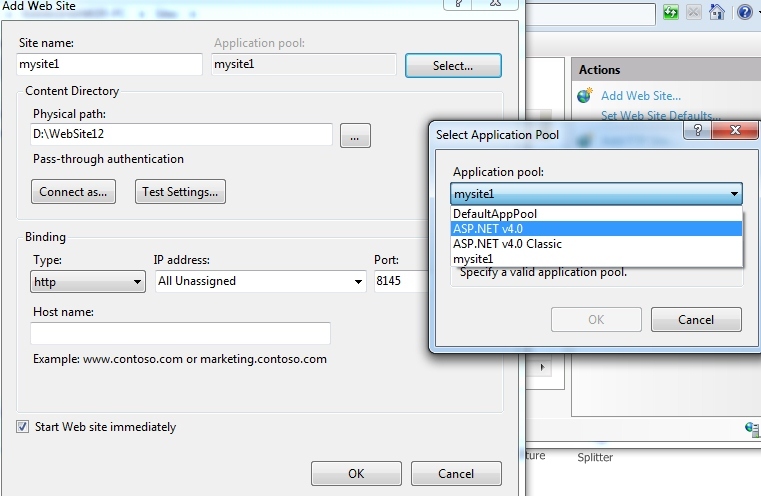 If your using Visual studio 2008 or less then no need to install .NET Framework 4.0 . There are some steps please follow step by step which are given below. Step :1 First install IIS Server in your system(Window 7).For Window 7 Operating system follow it. IIS and click Internet Information Services(iis) Manager. Step :4 Now filled the following fields which is shown below in image. Enter Site name-->Physical path(Select your website path)-->port (Do not enter 80 port because it is predefined port number its give error,you can write the port number less than 65535)-->Now click Select button and select ASP.NET v4.0 or 4.5 -->Click OK. Step :6 Now Type localhost:8145 in Browser Url.you will see following page. Step :7 Now Enter the Required field values and Press Submit Button. Step :8 Now Click Click here button , write the Unique Number in textbox and click Verify button. You will have seen that website is hosted and database is also working properly. If you are using Window 8 then No need to install .NET Framework 4.0 because it is already installed. If your Ms sql server is not working read this post Click here from bottom. Please share this post to all friends and if any problem please comment it. After step 4 ,i m getting an alert of"the specified directory does not exist in the server"..please give me a solution. Wow! Nice information. There is wonderful on "How to Host ASP.NET Website on IIS Server". I am intimidated by the value of in succession on this website. There are a lot of excellent assets here. Definitely I will visit this place again soon. I think, The ability to install many different programs on Windows is great, but removing them can easily become a nightmare. I know something about this same information, to know you can click here. This site is really very informative! I will definitely visit this site again and again!! Thanks a lot admin!